Horse-and-Horse-Information.com is a national and international horse information website with a specific focus for serious buyers of horse information and physical horse tack and health products across all disciplines of horse riders. Horses and Horse Information is available to all independent buyers and sellers to list their own horses for sale for free which brings in additional qualified horse owner traffic for your offering. The majority of our visitors are already horse owners, and have a specific interest in the broad range equine categories. We leverage the massive marketing power of the internet to sell your product within a particular focus or broader group of horse owners. Unlike other horse websites that try to sell you flashy rotating banners that most visitors have acquired banner blindness to, we give you content ads that convert to more visitors on your website. We also include the option for you to have full-page content articles as part of your package. Each month 85.91% out of our 3200 unique visitors each day have never seen your advertisements here before. Each visitor reads between 5 and 7 pages before leaving the website which creates almost 160,000 unique page views per month. Don't be fooled by other websites inflated statistics, we allow only a very restrictive number of advertisers to advertise at any one time. There will never be more than 20 display advertisers on the website at any one time. Look around the website and decide for yourself if this is the kind of website you want to associate your product or service with. Once you have looked around you will know why the American Horse Rider website is in the top 5 most popular websites for horse owners. What do advertisers get for only $100 per month? 1. Featured text ad rotating on every page of the website. Your text ad must be written in a tip format and can have one link out to your website. The link to your website is for advertising, target market exposure, and traffic gaining purposes, and will not boost your search engine positioning. We have tested many ad formats and have found content based ads that appear helpful to the reader will yield the most click-thoughs. We guarantee that we will not take on more than 20 advertisers at one time to insure your ad gets superb exposure on our website. 2. Submit up to three quality articles for inclusion on the website. You may submit up to 3 original, on-topic content articles that may or may not promote the benefits of your product or service. Articles should be written in a manor that is helpful to the reader and should offer information that is on topic with the content of Horses and Horse Information website. The articles you submit may include up to three links back to your site. What can advertisers expect from us upon payment? Exposure to 1000's potential customers interested in equine related services and products each month. A follow-up email that will include information about ad copy length and how to submit your ad copy for immediate placement on the website. 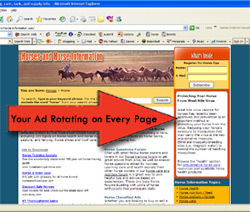 Immediate (24-48 hours after ad copy is submitted) placement of your ad and/or articles on the Horses and Horse Information. Prompt and automatic credit card billing for $100 each month. A six month advertising contract is required. This assures us that you are serious about offering our visitors a quality product or service and guarantees you the low advertising price of $100 per month during that 6 months. 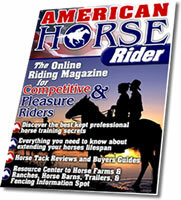 Please order your advertising spot on American Horse Rider at horses-and-horse-information.com by clicking the link below.